From Star Ace Toys. He was the right hand of He Who Must Not be Named and was the first to respond when the Dark Lord returned. Star Ace presents their latest villain in the Harry Potter sixth scale collectible figure line, Lucius Malfoy, the father of Harry's school nemesis. 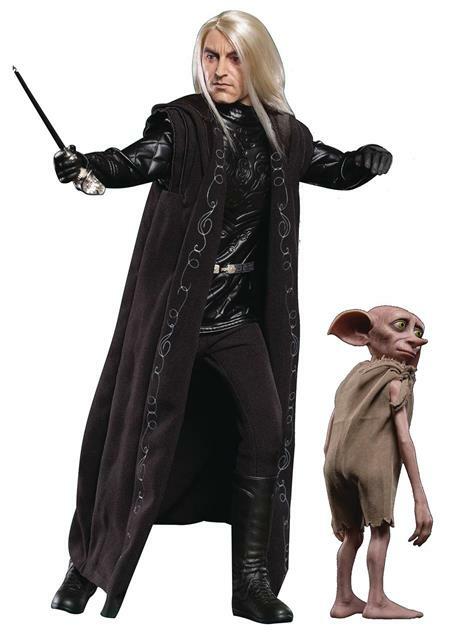 This movie-accurate collectible figure features realistic hair and an authentic likeness of Jason Isaacs as Lucius Malfoy as seen in Harry Potter and the Goblet of Fire. This special edition comes with not only his Death Eater mask and robes and his snake-head wand hidden in his cane, but a Dobby figure as well!